Each year, after a hectic Spring and Summer, the Pack will have a fun day out somewhere, and this year decided to go to Drayton Manor Park near Tamworth in Staffordshire. With a mini-bus and two cars loaded with 17 Cubs and six Leaders, we set off early on this very foggy morning, arriving at the Park just before the rides and other attractions opened. 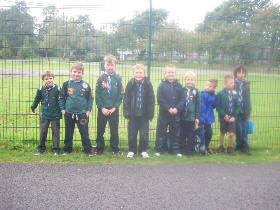 By this time the fog had lifted, the sun was trying to shine and the Cubs and Leaders were raring to go. In the morning, each Leader took a small group of Cubs around the Park to show them all the rides and attractions and for them to have a go on anything that they wanted. For the more adventurous, this included the bigger rides such as Air Race, which took you on a stomach-churning aerial adventure, Apocalypse, voted the scariest ride in the UK, and Maelstrom, the only gyro swing to face you outwards. There was then two rides that virtually guaranteed that everyone would get wet, which we did, namely Stormforce 10, which at one point sent the boat backwards down a roller coaster, and Splash Canyon, where the round boats made their way along a fast flowing river. As though it wasn’t enough to have waves thrown into the boat, we also had water ‘fired’ at us as we went through a tunnel. Some of the favourite rides for the less adventurous were the Dodgem Cars, Carousel, Pirate Adventure, the Pirate Ship, Big Wheel, Buffalo Coaster, Drunken Barrels and the Wild West Shoot Out. For those who wanted a break from the rides, there was also the Zoo and Farm. After lunch, where all the Cubs were chattering at once to say what they had been on or done during the course of the morning, the three younger Leaders took the Cubs who wanted to go on all the more daring scary rides again off in a group of their own while the remaining three Leaders took the other Cubs to go back on their favourite rides. By the time we left the Park to go home, everybody was exhausted but all agreed that it had been a thoroughly wonderful day, with one Cub declaring it the ‘best day of his life’! !